queen of the castle recipes: What I Love About Being a Homemaker . . . Being home to get fires going, giving physicality to the statement, "Keeping the home fires burning"
These are simple SMOKED SALMON APPETIZERS. 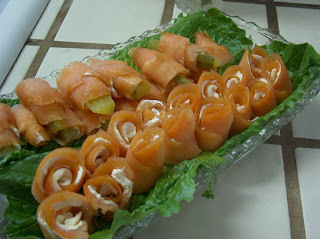 Spread smoked salmon strips with softened cream cheese. Put sliver of dill pickle in center and roll up. Voila. What do you love about being a homemaker on a random day in December? I like the ability to personalize our space and make it welcoming to others through good food and fellowship. I like being able to run errands during the day to help hubby and home! I like being able to make a dinner that requires a little extra time and effort b/c I'm home to do that,rather than a rushed dinner every night. Beautiful post, Lynn! I really love being able to make my house a home! This month I am loving organizing the house for the holidays. Everyone is coming home for the first time in several years. Today I did the tree- not quite done- but I loved having the time to do it slowly and with love. Thanks for visiting my blog; I am pleased to see your blog and I'll check in regularly. I'm going to be a baking fiend for the next few days. Sausage balls, turtles, cookies, cinnamon rolls....I feel the pounds a-comin'. I love being able to decorate my tree for the family in the middle of the day. My kids are grown up, but they still want a tree... love it! Those appetizers look yummy! I enjoy my home so much, too, and am thankful for it. Have a good weekend. Nice easy appetizer - full o flavor. I like it! 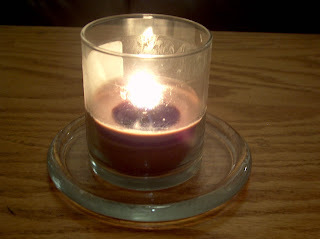 I love spending my days the warm, cozy atmosphere of a home rather than a florescent-lighted cold environment. I am surrounded by my family and the comforts of home. I love my kitchen and I love cooking and I love your blog; very nice! Just wanting to wish you a very Merry Christmas and a wonderful 2010. I like "taking care"; I like having the time to dream, to visualize, to actualize. I like planning for our future, even if it's only just to the next meal. To sit cuddled in a blanket on this winter day and look at spring flower catalogues. Just doing a flutter by to wish you the best in 2010. Thank you for sharing your recipes and your insights with us. You've made me smile!